Hotel Mirage i Rom, Italien: Reservér nu! 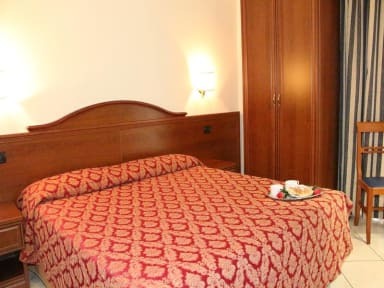 The Mirage Hotel is a comfortable hotel, located in the heart of Rome and just a few steps away from the station Termini, with air terminal, the Opera house, the beautiful basilica S.Maria Maggiore, Colosseum, Via Veneto and the Roman forum. 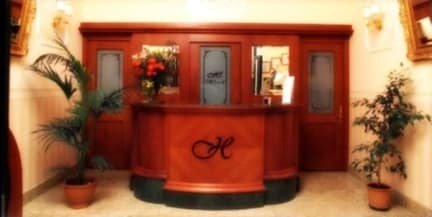 The hotel staff is friendly and glad to help guests with reservations and useful advice. The hotel offers 14 single, double, triple and quadruple rooms, featuring private bathroom, with hairdryer. The rooms are furthermore equipped with individually controlled air conditioning, satellite TV, mini bar, safe, Internet connection and direct dial telephone. Rooms for disabled guests and non smokers are also available.